What better way to protect your monitor's phosphor than by smashing rocks into it at dozens of kilometres per second? 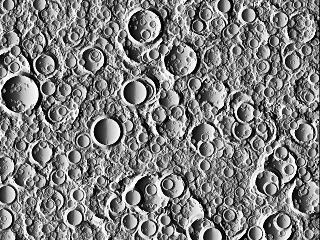 This directory contains a Windows screen saver named “Craters” which simulates cratering of initially flat terrain, obeying the same power-law relating crater size to number observed on airless solar system bodies. The Craters Screen Saver, including its source code, is in the public domain. You can do anything you like with it. Versions of the Craters Screen Saver are available for both 16-bit and 32-bit windows. Download the version appropriate for your system using the following links. After you've downloaded the program archive, extract the contents with Info-ZIP or a compatible archive extract program, and copy the CRATERS.SCR file to your Windows directory (usually C:\WINDOWS). The use the Control Panel to select and configure the screen saver. The current 32-bit release of the Craters Screen Saver was built in July 2006 and has been tested on Windows 2000 and XP machines. Some programs built with recent development tools have difficulties running on older 32-bit Windows systems such as Windows 95 and 98. If you encounter problems on such a system, Release 2.0 will almost certainly work for you. All prior releases remain available. Earth and Moon Viewer . Solar System Live: interactive orrery. Terranova: a new terraformed planet every day. Experienced C programmers who wish to modify the screen saver or simply look under the hood to see how it works may download the source code for either the 16- or 32-bit versions of the program. You're welcome to use this source code in any way you like, but absolutely no support is provided for it—you're entirely on your own.